I was also led to believe that most Americans aren't that bright, that they are loud, brash and arrogant, and I'm not British like Stephen Fry. However, my soul told me otherwise, and I discovered a continent of friendly and accommodating and interested-in-me people, as well as beautiful and inspiring scenery. So much so that I call America home as it's where I am at peace. Stephen Fry very fairly "picks" on his own country's shortcomings (I love Britain too!) as he works his way across all fifty states in a London taxi. What fun. His American discovery starts on the East Coast in Maine, and he apologizes ahead of time for not being able to visit each and every place in each and every state. Along the way he observes everything, and there is much to observe and ooh and aah about, and he lists key facts which are interesting. He talks about his firsthand experiences in his famously and indominately humorous way, and I found myself chuckling away at his words. He is known to be a bit of a comedian, you know! And you've got to read his assessment of Donald Trump! Spot on! In most states he spends just a little time, but there are a few which he just skirts, with a full apology, of course, for not staying longer. He delights in doing a little lobster fishing, fishing on a frozen lake, attending a rodeo, swimming with the dolphins, visiting a Bourbon distillery, listening to blue grass, visiting desolate deserts, and goes from frozen Barrow, Alaska to the beaches and volcanoes of Hawaii. 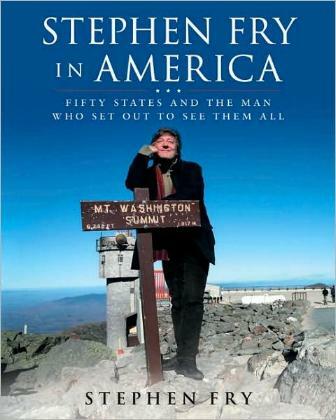 Not only did Fry learn more about America and her people, but also more about himself and his own country and people. I loved this book so much and highly recommend it to anyone, whether you live here or plan to visit. Conclusion - A superb way for Americans to "see" their own country through the eyes of a foreigner. I wished there were another fifty states he could visit.